Is there really any other flavor that describes “spring” like Carrot Cake? In my view it is the quintessential spring time flavor. Why, you ask? Simple! Carrot Cake means that the winter ground is thawing, spring has sprung and flowers are about to bloom. Yes, I make carrot cake all year long but spring time is when I love to make this tasty treat for these reasons alone. Sometimes, I want to get a “taste” of the wonderful blend of carrots, cinnamon, brown sugar and the tangy cream cheese frosting but do not want to make a whole cake. I knew that if I felt that way there must be others who want that too so I had been thinking for a week or so about making a 2-3 bite carrot themed dessert that any home baker can whip up at any time easily and quickly. Last week when my friends over at Liberty Tabletop sent me some of their bake-ware to use in my kitchen. When I opened the packages, like a kid on Christmas, I saw the most beautiful stainless steel baking tray ready to be put to use (I think my heart fluttered a little bit at the quality and beauty of it all). I knew EXACTLY what I wanted to make first. 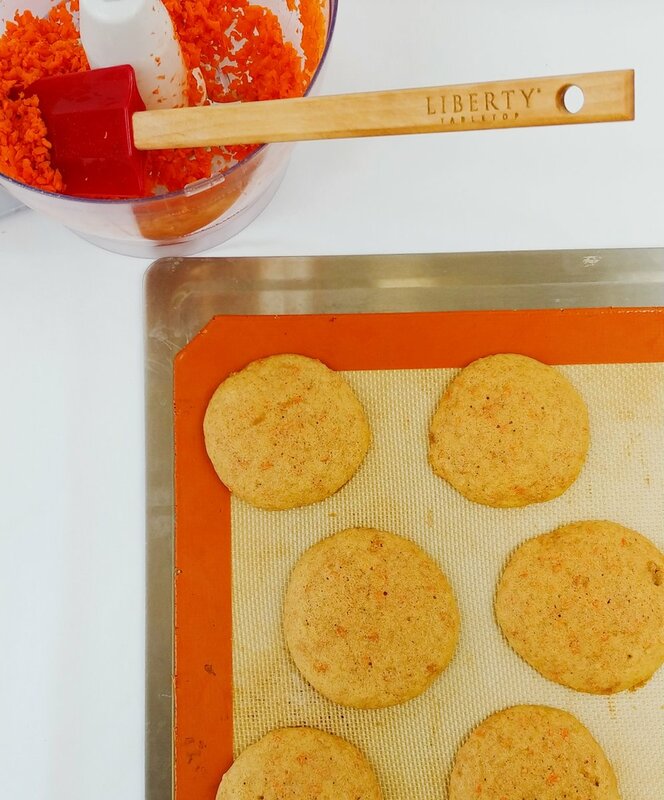 I said to myself…..i’m making Carrot Cake Cookies! It took three rounds of recipe development and taste testing ( I know, tough life) for me to create these light Cake-y (is that even a word?) textured cookies, inspired by my carrot cake. It is truly just that….part cookie, part cake…..a delicious combination that is fantastic by itself simply smothered on top and sprinkled with walnuts. But, if you want to get fancy (we all know I can get a bit fancy) swirl cream cheese filling between like a whoopie pie. These cookies absolutely satisfy my carrot cake craving and if you are a carrot cake lover they will satisfy yours too. Plus, these beauties are easy for anyone to transport to a party or family function. Make sure to keep one behind for yourself though as these cookies wont last too long. I will admit, when I finished assembling the final recipe for these cookies, I scarfed an entire cookie in THREE bites and had to stop from eating a second - they are THAT good . 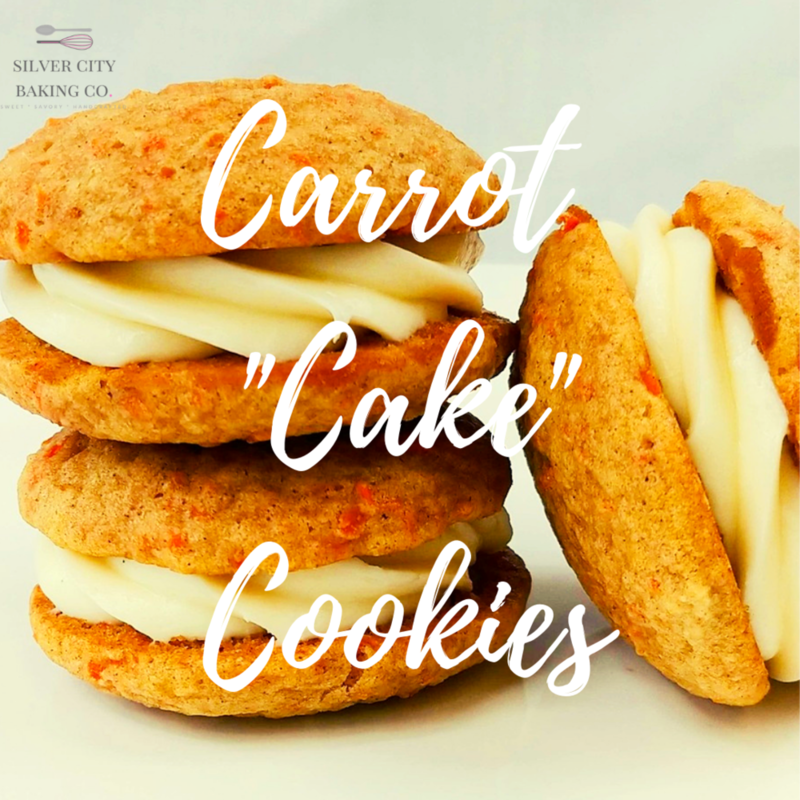 So, if you like carrot cake and are looking for a tasty treat to take to your springtime event then these cookies are a must for you to make. Enjoy! You can watch my video tutorial HERE for step by step instructions. Make sure to SUBSCRIBE to my page and follow me on Instagram and Facebook and dont forget to PIN this recipe on your Pinterest saves! Pre-heat the oven to 350 F. Measure all ingredients. Sift dry ingredients and set aside. Place carrots in food processor and pulse till carrots are a fine shred. Set aside. Place sugars and butter in a standard mixer and using the paddle attachment beat until sugar and butter are creamed. Add eggs and beat until light and fluffy and no traces of egg remain. Next, combine the dry ingredients, carrots and milk to the sugars and blend until just combined. Using an ice cream Scoop place dollops of batter aprox. 2 inches apart onto a lined baking tray and bake for 11-13 minutes. Turn the tray halfway through baking for even browning. Cool on the tray and remove with a spatula and cool completely. Fill with your favorite cream cheese filling or just pop one off the tray and eat it on its own.